Bootcamper of the Program - Congrats! "I feel like I have gained years of youth as I get stronger every class." Patty's positive attitude and energy in class has inspired her instructor to nominate her for Bootcamper of the Program. Her commitment and dedication to the Body Buster Program has contributed to her 8lb weight loss! She registered early for the next program and we are excited to be a part of her fitness journey. I like that the trainer pushes me but within my limits. I like that the Body Buster workout is a total body workout and most of all I like the results I've already seen on my body. I feel more energy. I can sleep much better and am a happier mom to my family as the stress from my job is erased every time I come home from a Body Buster Fitness class. I feel I have gained more mobility and self awareness of what my body is capable of. I am more conscious of my mental health and deal with stress much better. I can focus on my work better just as I have learned to focus on my workouts. I feel like I have gained years of youth as I get stronger every class. Don't be scared to try. This course is for all fitness levels and ages and customizes to each person. You will be a better you. This Summer was a fantastic one for Body Buster Bootcampers! Outdoor bootcamps were enjoyed by all our members and we had a great time taking advantage of gorgeous weather and our outdoor locations! However, Fall is closing in and we are getting ready to move indoors to stay warm and dry when it finally hits! October 14th is the start date for the next 4 week boot camp that will be a mix of indoor and outdoor classes. Get out here with us and join a fun, motivating, life-enriching fitness program that spices up an average weekday morning or evening, with awesome benefits for your body, health and wellness! 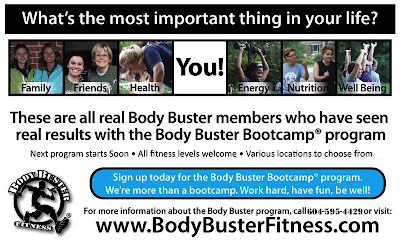 Join Body Buster's next bootcamp or sign up for another 4 week program if you took a break for the summer! You will be glad you did! Part of our Body Buster team set up shop yesterday at the Grand Opening of Willoughby Town Centre. What a fantastic day it was meeting fellow Langley businesses, artisans and neighbours! Township of Langley Mayor, Jack Froese also attended the event showing his support for the new development and sealing a time capsule to be buried at the centre. With great weather, great music and great people...the event was a hit! The Body Buster team was able to meet a great deal of the Langley community and share our approach on health, wellness...& BOOT CAMP! Thanks for coming out! BBF Instructor Kim meets the Mayor! BBF girls show off their t-shirts! "More Pushups Please!" "I <3 Burpees"
Join Team Body Buster at the Canadian Breast Cancer Foundation CIBC Run for the Cure October 6, 2013! 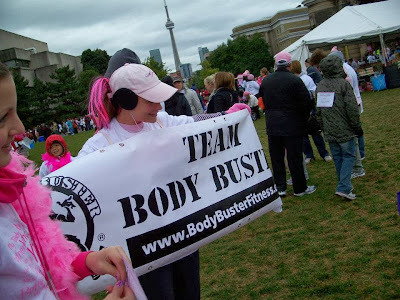 Since 2008, Team Body Buster has proudly participated in the Canadian Breast Cancer Foundation CIBC Run for the Cure. Our team is comprised of Body Buster Fitness Instructors, Members and Family/Friends of all ages! In past year’s we’ve even had some four-legged friends on our team on run/walk day! While there are many important charitable fundraising events tied to physical fitness, Body Buster Fitness has chosen to whole-heartedly back and encourage our members to join our team and participate in this event! We support the Run for the Cure for a multitude of reasons. The first being that the Canadian Breast Cancer Foundation uses the donations raised to continue funding groundbreaking research, education, awareness and advocacy initiatives. The Foundation seeks to emphasize the value of healthy living, regular breast cancer screening and examinations, and significance of supporting women in our families and community. Moreover, this event gets our strong support because it promotes the Body Buster approach of exercise being possible for any individual no matter what their fitness level. The Run for the Cure offers both walking and running options (1 km or 5km) at the event every year, which allows our team members to positively contribute to the best of their abilities both physically on run/walk day and monetarily through any donations raised. To join our team visit: www.runforthecure.com and select ‘Register for the Run’ then select ‘Surrey’ as your location. Once the Toronto Run page has loaded, select ‘Join an Existing Team’ and search for‘Team Body Buster’ to be a part of this rewarding and ground breaking experience. To donate to our team visit: www.runforthecure.com and select ‘Donate’ then complete your search by our team name ‘Team Body Buster’ or search an individual on our team. The Body Buster Fitness ‘lifestyle’ focuses on the importance of healthy living, emotional well-being and physical fitness. To gear up for the walk/run we recommend that you continue to attend your regularly scheduled Body Buster Bootcamp classes to maintain and improve your fitness level as you prepare for your 1km or 5km walk or run. Additionally, we’d love for you to go for a walk or run at least once a week over the next 2 weeks leading up to October 6th! Speak with your Instructor at your next class for a more detailed workout plan to assist in your success at the run/walk. We want your support in any way possible! Let’s make this Team Body Buster’s contribution and participation a success at this year’s Run for the Cure! See YOU on October 6th at the Run! Make a commitment to your health and fitness and see what makes Body Buster the BEST Bootcamp Program in Langley! MOTIVATION: That which gives purpose and direction to behaviour. 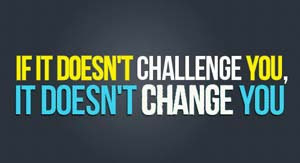 Staying motivated to exercise and continue to challenge yourself is tough. We all look for something to inspire us to exercise, something to help us get moving. Where does that something come from? Body Buster® qualified instructors give you the motivation you need to make positive changes and hold you accountable to follow through. Our instructor's get to know YOU and YOUR goals & get you excited about working out! Back to School, Back to Your Routine, Back to BODY BUSTER! September means kids are going back to school and people are getting back in to their fitness routine! 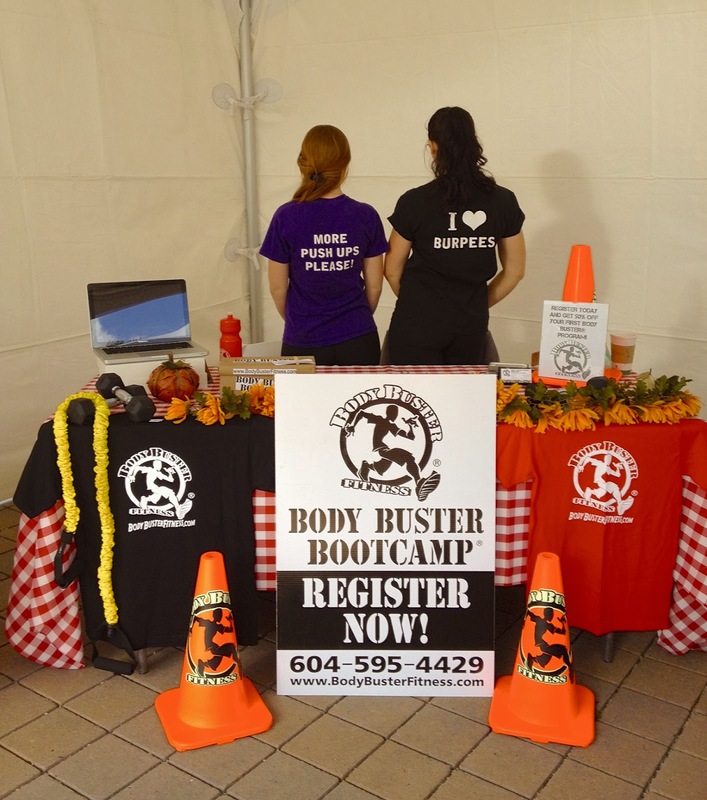 Body Buster Fitness Bootcamps are easy to fit into your busy schedule throughout the Fall. Qualified Body Buster Trainers will help you achieve maximum results in minimum time. BOOTCAMP work outs are efficient and NOT time consuming! Body Buster Bootcamp classes available 5 days a week, mornings and evenings at various locations including South Surrey, Fort Langley & Murrayville. Fall is Almost Here...Start Setting Your Fitness Goals! Get out here with us and join a fun, motivating, life-enriching fitness program that spices up an average weekday morning or evening, with awesome benefits for your body, health and wellness! 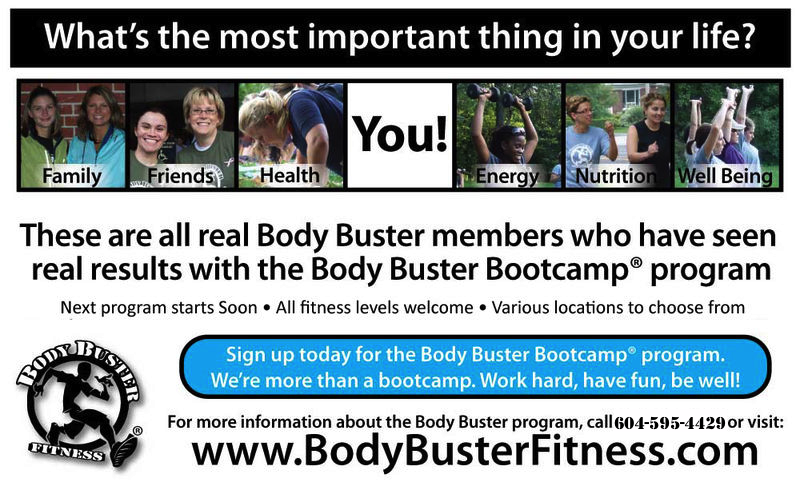 Join Body Buster's next bootcamp in Langley or sign up for another 4 week program if you took a break for the summer! You will be glad you did! Take advantage of more free time when the kids go back to school! Morning and evening classes available. You deserve to try this for yourself and enjoy the feeling of accomplishing your fitness goals! Body Buster Fitness Bootcamp is great for all ages and Fitness Levels, Men and Women! Meet great people, feel and look healthy, get in to a fun fitness routine, and have the support of awesome, motivating trainers! Body Buster Fitness® classes are specifically designed to push you to become as physically active as possible, no matter your fitness level! CHALLENGE YOURSELF AND GET THE MOTIVATION YOU NEED TO GET RESULTS...FAST! Body Buster Bootcamp® will help you work your entire body, by introducing a balanced workout through a variety of exercises; including a mix of cardio, running/power walking, endurance training, strength training, yoga, stretching, obstacle courses, circuit training, core conditioning, drills, and much more.